In 1490, Kaiser Maximilian I awarded Franz von Taxis the contract to deliver mail between the Kaiserâ€™s residences in Innsbruck and Brussels. He did such a good job, that postal services in the country continue to be connected with the name Thurn and Taxis. With the introduction of postal carriages in the middle of the 17th century, members of the family were raised to Count status and given the hereditary title of Postmaster General. The game begins at this point in history. Can you emulate the achievements of this family and build a successful postal network? Do you have the talent to connect the right cities to create an effective network and not lose sight of the need to acquire new carriages when they are needed? Plan your moves carefully and watch your opponentsâ€™ moves carefully, so you are prepared to respond to them. The game takes you back in time and gives you challenges that will bring you back to the game over and over. 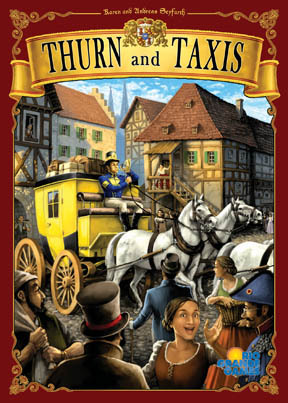 Other products in the "Thurn & Taxis" series. This is a fun, light strategy game. At least that was my first impression. It is easy to teach but there are several layers of strategy that make this game appealing to both casual and heavy gamers. I like that opponents can't block your connections unless they take the card you want. But with three of each city in the deck, this is a pretty laid back game. Each turn you can choose one of 4 bonuses to use which can be very beneficial as you try to make your plan become a reality. Lots of ways to get points in the game which makes for a great time. This is one of my most played games. It provides a good mix of strategic and tactical decisions and typically plays in just around 1 hour. Thurn & Taxis is one of my favorite games to play with my wife. It scales well from 2-4 players, and has very subtle player interactions as you race to get VP chips before the other players. Balancing getting those chips against getting the better carriages and ending the game is demanding, but when everything works, the game is sublime.